Jumanji is one of those 90’s films that’s just hard to forget, starring Robin Williams as a man who has been trapped in the Jumanji board game for twenty-six years. The film was the 10th highest grossing movie in 1995, earning $263M at the worldwide box office on a $65M budget. Kirsten Dunst, David Alan Grier, and Bonnie Hunt also star in the film directed by Joe Johnston. The movie has been digitally restored from the original film negatives for brand new Ultra HD Blu-ray and Blu-ray releases, set to hit stores on Dec. 5, 2017. The remastered edition of the original Jumanji film coincides with the December release of Jumanji: Welcome to the Jungle starring Dwayne Johnson, another action comedy based on the concept of being trapped inside a game but this time an old video game console is the transport mechanism. 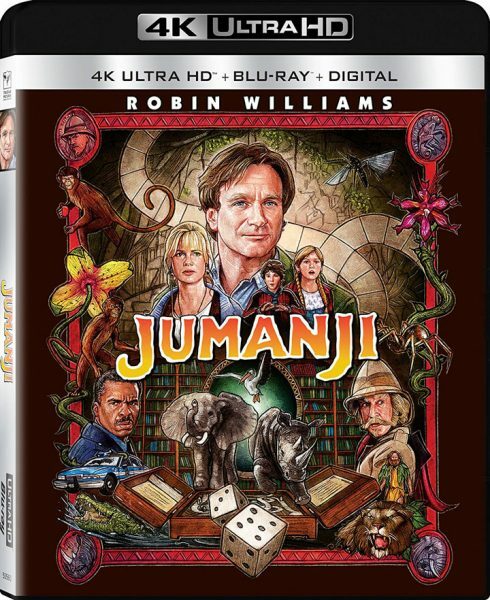 On 4k Ultra HD Blu-ray, Jumanji is presented in 1.85:1 aspect ratio at 2160p resolution with HDR10 color enhancement. The English-language soundtrack is provided in Dolby Atmos as well as Dolby TrueHD 7.1. The 2-disc Ultra HD Blu-ray and 1-disc Blu-ray editions from Sony Pictures include never-before-seen special features and fully remastered picture and sound. The combos also include a digital copy.